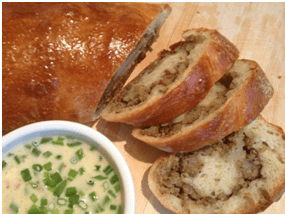 Combine warm, freshly-baked bread with savory garlicky crumbled sausage for an addictively delicious so-simple party appetizer. Whisk all sauce ingredients together and reserve. Sauce can be made up to 1 day ahead. To make bread, preheat oven to 375 and line a baking pan with parchment. Cook sausage in a large non-stick sauté pan, using a wooden spoon or spatula to break up into little pieces as it cooks. When nearly cooked through (and some pieces are beginning to brown), add garlic to pan. Continue to stir until all sausage is cooked. Remove to a paper towel lined plate. Press dough on a lightly floured surface into one 18x8” rectangle. Spread drained sausage across dough evenly, leaving a 1” border on one long side. Roll bread up lengthwise towards the 1” border. Pinch the seam and ends closed and transfer bread, seam-side down, to baking sheet. (You may need to form dough into a u-shape or divide into 2 loaves, depending on the size of your baking pan.) Brush top of bread with egg yolk mixture and bake 35-40 minutes or until done in the center. Allow to cool for 10 minutes before slicing. Serve warm with dipping sauce at room temperature. To speed game-day prep: Prepare Grainy Mustard Sauce and cook sausage the day before. 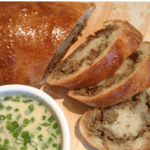 The morning of the party, roll up bread loaf with sausage and reserve in refrigerator until ready to bake. Alternatively bread can be made and sliced earlier in the day and reheated in a warm oven just before serving.